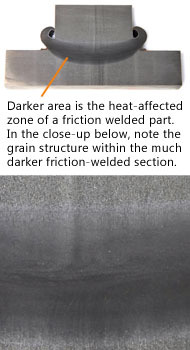 Destructive Weld Testing involves the physical destruction of the friction welded components. A variety of testing methods can be employed to evaluate the weld’s characteristics. We perform these tests on all prototype welds per customer specifications. Using a macro etch test (and depending on the base material(s) joined in the weld), a mild acid mixture is applied to the cross-section surface. The resultant etching provides an excellent study of the internal structure of the weld, which is also helpful in detecting welding problems. Additional tests may be applied to validate ductility, soundness of welded joints, tensile strength or any presence of slag inclusions or weld quality discontinuities within the entire length of the weld. 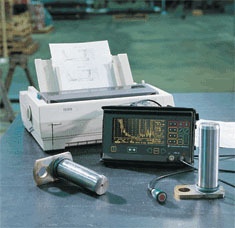 Ultrasonic inspection is used regularly to ensure weld integrity. This test is performed per customer specifications. 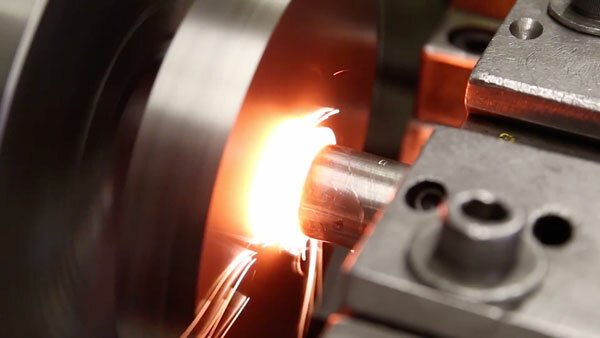 Non-destructive testing also involves inspection of welded components by subjecting them to the required service conditions to determine suitability. These tests are designed to reveal defects that may impair service performance. They will not break or alter the structure or appearance of the friction welded piece.